Melbourne’s first School for Social Entrepreneurs (SSE) was today launched on a city rooftop with century old links to social enterprise in Melbourne. Speaking at the launch on the rooftop of the Queen Victoria Women’s Centre, CEO of the School for Social Entrepreneurs, Benny Callaghan, says the rooftop location was the site in 1895 of the first hospital in Victoria run ‘for women, by women’, and showed bold thinking that defies social conventions, a trait shared by many of the students of the SSE. The launch of the Melbourne School for Social Entrepreneurs (SSE) follows the successful first year of operation of the SSE in Sydney. The SSE Australia is based on the highly successful UK SSE which has been pioneering the development of social entrepreneurship and social enterprise for over 12 years. The Lord Mayor Robert Doyle welcomed the 22 students who he says are working on a range of projects around unmet need in their communities, describing them as being at the cutting edge of thinking. Callaghan, says that with the addition of the Melbourne School, there should be 200 graduates of the year-long program by 2012. He says the support they have received in Melbourne has been great, with higher than expected numbers applying to be part of the program. Student projects include a social enterprise centre in Broadmeadows to be run by disengaged young people to develop ‘real life’ business skills, an education program to tackle bullying and homophobia in schools, and a short film about women living with HIV/AIDS, aimed at drawing interest back to the issue. The SSE program is based on ‘action learning’ which involves students developing both their business and life skills through applying their learning directly to the project. Callaghan says that students come to the program with incredible passion and purpose, but they don’t necessarily have the processes to turn their idea into reality. The school works towards this reality through coaching, small group exercises, meeting social entrepreneurs, visiting successful enterprises around Melbourne and by providing individual business coaches. Callaghan says one of the most important parts of the program is the networking and support that the students give one another. He says that many young social entrepreneurs find people don’t understand what they are trying to do, they don’t have the same vision and passion, and they can be left feeling isolated. It’s a thought echoed by serial social entrepreneur Simon Griffiths, who started Shebeen, a venture that sells beers from developing countries in Melbourne bars, with proceeds being investing in programs in the country of origin. Griffiths says its great to be surrounded by people with similar ideas, instead of being on my laptop in my kitchen at home. 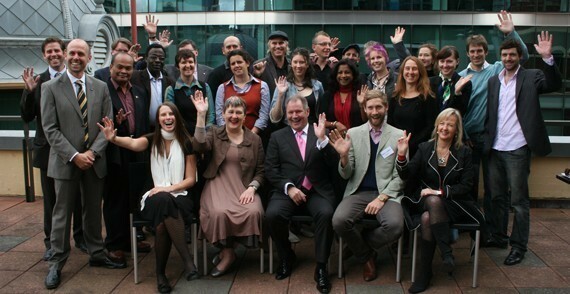 Social Ventures Australia, a key player behind bringing the successful UK model of SSE to Australia, believes there is a real need to support the work of Australian social entrepreneurs on the basis that they are uniquely positioned to address some of the key social challenges facing our disadvantaged communities. Simon Griffiths, whose projects include Shebeen as well as ‘Who Gives a Crap’ – a social enterprise built around investing the proceeds from toilet paper sales in water and sanitation programs in the developing world – says he hopes being part of the SSE program will help his organisation to leverage support on the bigger stage. He says the program provides an amazing opportunity to be able to make connections to state and federal government, local councils, NGO’s and big corporates that would have been outside his grasp otherwise. Many of the projects are well established, functioning ventures that need help taking the next step. Shebeen is already selling products through Melbourne bars – you can find their Ethiopian beer at Madame Brussels, their Namibian beer at the Alderman in Brunswick – but Griffiths hopes to be able to open a social enterprise bar in Melbourne, and will hold an investor information evening to raise funds for the Shebeen enterprise. Proceeds of the beer sales flow back to projects in the beer’s country of origin. Griffiths says projects are selected according to Shebeen’s mandate around allowing individuals to participate in their own economy, so in essence we are encouraging social enterprise in each of the nations. Whether that’s vocational training, taking street kids and teaching them how to chef or run the front of house at a restaurant, or supporting microfinance projects in Ethiopia, we find stuff that’s going to have a large impact, and ensure that the organisations doing it are high quality. The $24,000 cost of the 9 month program is met mostly though philanthropic grants and federal government support, with the students contributing $1,200.